Doris Marie Compton, PP, PLS, lived in many different towns in the State of Arkansas, as well as in Enid, Oklahoma, and Abilene, Texas, before finally making her home in Little Rock, Arkansas. Long before Doris knew about NALS, she was involved in the law through her dad’s profession. He was an Arkansas State Trooper. Her lifelong interest in the law led to a legal career after her second son was born and she was ready to return to the work force. She knew nothing about what was required of a legal secretary so she visited the local library in Abilene, Texas, to find information on the job requirements. Luckily for her and NALS members, Doris found the NALS Basic Manual for Legal Secretaries. She found the book to be full of information and how-to’s and believes the information she uncovered ultimately helped her secure the position she was seeking. Rita Thatcher, ALS, CPS, will be front and center in Tulsa when Doris is installed as our president. She wants you to know Doris is passionate about NALS, gracious, caring, considerate, fun, friendly, and outgoing. She is the very embodiment of everything that NALS stands for—integrity, professionalism, and commitment. Doris originally joined NALS while living in Texas in 1985. During the process of moving back to Arkansas, she let her membership lapse for a short period. She rejoined NALS in 1988 and subsequently became a Life Member. Mary Hand, PP, PLS, another “front-and-center” participant in Doris’ installation festivities, finds Doris to be a wonderful lady, with a great sense of humor, who will make a fantastic president. Having known Doris for almost 20 years as her leader on both the chapter and state levels, Mary is looking forward to Doris being her leader on the national level. When Doris was asked “When did you know you wanted to be NALS president?” her response was “Wow, that is a tough question.” She went on to say shortly after returning to Arkansas she met then-president Barbara Akins while attending a seminar. Barbara made such an impression on Doris that the idea of “That is what I want to be when I grow up” was planted, and Doris credits each succeeding NALS president with furthering that dream. In 1988, Doris began her local Arkansas chapter volunteer work by chairing the Annual Christmas Party Committee. She held her first officer position from 1990 through 1992 as recording secretary. Then she managed the money for her local chapter and held the office of treasurer from 1992 through 1993. Her next step up the chapter officer ladder led to serving as president for not just one, but two consecutive years, from 1994 through 1996. She filled her volunteer calendar from 2002 through 2005 as her local chapter’s parliamentarian. She did double duty by also serving as a panel participant at Vo-Tech College from 2002 through 2005, a position she held through 2008. Greater Little Rock Legal Secretaries Association named Doris their Legal Secretary of the Year in 1994. After getting her feet wet by serving as treasurer of her local chapter, Doris held the position of treasurer for the Arkansas state chapter from 1993 through 1994. 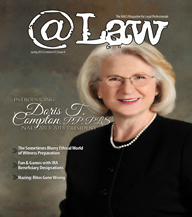 The same year, the Arkansas Association of Legal Secretaries honored Doris as their Legal Secretary of the Year. Serving as local chapter president kept her away from holding a state office for a few years, but in 1999, she returned as the Arkansas state president-elect and membership chair. She served another two-year term as president, this time on the state level from 2000 through 2002 and, in 2002 through 2003, she served as immediate past president of her state chapter. Cheryl Summerhill, PP, PLS, is impressed with the energy, passion, experience, and forward-thinking ideas Doris has. She knows she will take NALS into the future and has the honesty, integrity, self-confidence, and commitment to be a successful NALS president. With Doris as NALS president, NALS members will have a dependable, reliable, mature, and effective leader. Cheryl went on to say that Doris has a great ability to communicate, a willingness to accept responsibility, and an insight to make and reach goals. Finding it hard to imagine Doris doing anything other than something in the legal field, she did say if her lucky stars came through and she won the lottery, she would retire and travel around the world. One of her best vacations was her trip to the Grand Canyon and Las Vegas before her sons graduated and left home. Another favorite world travel event was her trip this year to Paris and Amsterdam with her husband to celebrate her birthday. Being more grounded and knowing her chances of winning the lottery are slim, she would more than likely be a teacher with a focus on adult education if she were not in the legal field. With a long-standing connection to the law, one would think the first dollar Doris earned came from something other than household chores. Doris remembers her mom wanting to teach her how to iron and handing her a stack of her dad’s handkerchiefs. Doris bets she ironed ALL DAY long to earn that dollar!! You might also be surprised to know Doris was a Cubmaster for her son’s Cub Scout Pack and she eventually became a Boy Scout Leader, involved in training other adult leaders. She then became one of the Train the Trainers for the district and was awarded the District Award of Merit. Another fun fact is Doris met Supreme Court Justice Sandra Day O’Connor during a seminar in Hot Springs, Arkansas. The best advice Doris ever received was to “believe in yourself, always do your best, and whatever you do, make sure you can look yourself in the mirror and like what you see.” You will have the eyes of our NALS members on you as you serve as our president this year. Something tells me we are going to like what we see.